If you're anything like me - I'm always doing a craftroom dash for a card. Usually it's because my children have a birthday party to go to and I'm in need of a card. Today was no different! I don't generally blog post them, well, because I don't think my very simple '10 minute dash' cards are worthy! 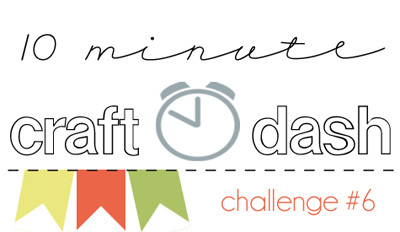 I discovered the Craft Dash Challenge on one of my blog surfing nights and thought this challenge was clever. It's also nice to see some cleaner, more easier cards that haven't taken 3 hours to produce! Sometimes our '10 Minute Dash' cards are just as nice! I'm so thrilled you heard about my 10 Minute Craft Dash! 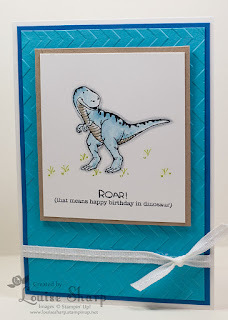 This card is darling- that dinosaur is so cute! Thanks for playing along in my challenge. I hope you'll join along in the future!